Disney Junior Muppet Babies Viewing Party! Yaaaayy! Disney Junior Muppet Babies Viewing Party! I have to admit, I am getting pretty excited (and nostalgic) for the Disney Junior Muppet Babies premiere this Friday, March 23rd! To celebrate, I put together some viewing party ideas for those of you also gearing up for the Muppet Babies debut. For a healthy snack, you can serve cups of strawberries and blueberries, to represent Gonzo (his iconic blue fur and his red overalls he wears in Muppet Babies). For a snack that’s tasty being green, some sugar snap peas served in cups that have some yogurt ranch dressing at the bottom! I think Kermit would approve. For a sweet (yet healthy, all-natural) treat, some carrot oatmeal cookies inspired by Animal! You can get the full recipe and tutorial to make them here. To represent the newest addition to the Muppet Babies, the cute purple penguin Summer, put out some coloring pages and crayons, or other art-related activity. (Since little Summer is an aspiring artist). For the glamorous Miss Piggy, some items to dress-up! Such as boas, necklaces, tutus, or tiaras! Play a game to bring out your silly side, just like Fozzie Bear! This game is pin the bowtie on Fozzie! To make it, cut out the pieces of his head and facial features out of felt, and hot glue them together. Then make several bowties, which won’t be glued on. These will be the pieces that the kids can pin onto the felt! It’s a Muppte Babies twist on the classic game Pin the Tail on the Donkey! And there you have it! 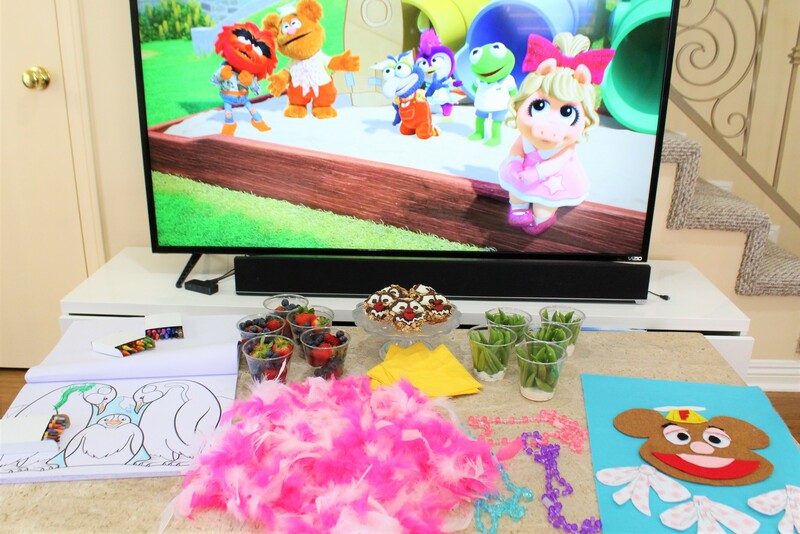 Some fun and simple Disney Junior Muppet Babies viewing party ideas! Be sure to tune into Muppet Babies on March 23rd!